Dearest One True Space Boy Elon Musk: I have located a suitable vehicle to act as your next test payload for when you want to shoot another car into space. 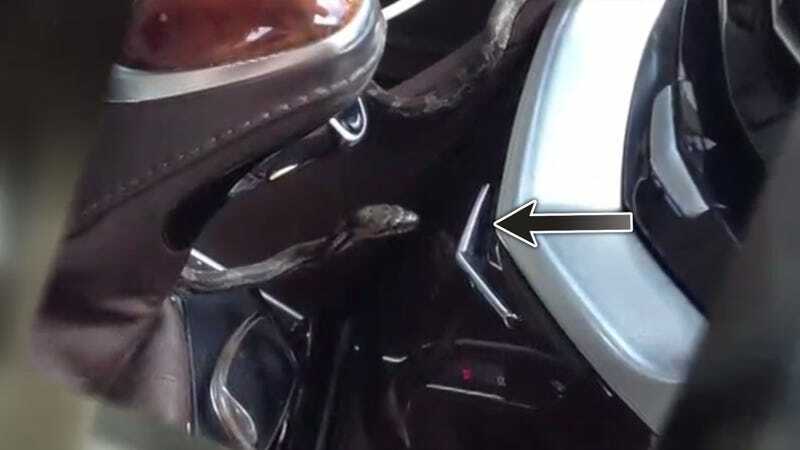 It is a Cadillac SRX, but I think everyone will agree that it needs to be fired directly into the sun after a two-and-a-half-foot-long snake crawled out of one of its air vents. Lora Goff was on her lunch break in Warrenton, Virginia, when she noticed a rattling sound in her SRX, reports the Washington Post. 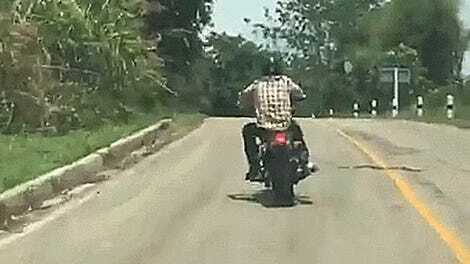 That sound turned out to be a black snake crawling out of the tall air vent right next to the driver’s seat. Goff was a cooler character than I would have been in this situation, calmly pulling the car over, getting out and calling 911. She even grabbed a couple photos of the little guy as she waited. Of course, it wasn’t that reassuring that the animal control officer who responded to the call also admitted to being scared of snakes. Goff said the animal control officer tried to use a piece of equipment, similar to long clippers, to catch the snake but couldn’t. Then the snake came farther out of the air vent and started to move around the car. It then fell down under the front seat. By then, she said her lunch break was over and she needed to get back to work so she drove back to her office with the snake still somewhere in her SUV. Because they couldn’t find the snake, Goff drove the SRX back to work, all while knowing that there’s probably a snake in the car. Her coworkers offered conflicting advice on how to get the snake out, ranging from turning the air conditioning on extra cold so the snake would be forced to sun itself on the seat to turning the heater up so it would drive the snake out. Ultimately, Goff borrowed a friend’s car (smart!) to fetch some glue traps, which she put under her seats. There wasn’t a snake on them when she had to leave work, so she spent her entire ten-minute nightmare drive home making noise in hopes of driving the snake out. The snake wasn’t trapped by the glue traps until over the night, when her husband found the little guy still alive but stuck on one of the traps. Goff’s dealership suggested that the snake may have entered the car through the condensation drain for the air conditioner, Fox 5 notes. Wet weather has pushed many snakes to look for a dry place to hide, which the cushy leather interior of an SRX certainly is. Either way it’s the ultimate betrayal of your trust in a car. I mean, the SRX has extremely good air conditioning. Those vents are meaty and huge, and very good at directing the sweet relief of ice cold air where you need it most. How can you trust this car now that a snake has crawled through its best feature? Or worse, can we truly be sure that no more snakes are hiding inside? I’m not so sure. The only logical solution to this is to fire Goff’s entire SRX into the sun, just to be sure. You won’t have to worry about space bacteria if everything is burnt to a crisp.